Individuals buying documents allegedly signed by U.S. presidents should buy this book to learn of when certain presidents stopped signing certain types of presidential documents. Presidents were required to sign land grants, but after signing a few Pres. Andrew Jackson grew tired of signing them and directed that his secretaries start signing them for him. Hence, a potential land-grant buyer should be alterted that what he/she believes is an authentically signed presidential land grant may really NOT be signed by a president after Pres. Jackson's tenure. During WWI, Pres. Wilson stopped signing military commissions (except for generals). 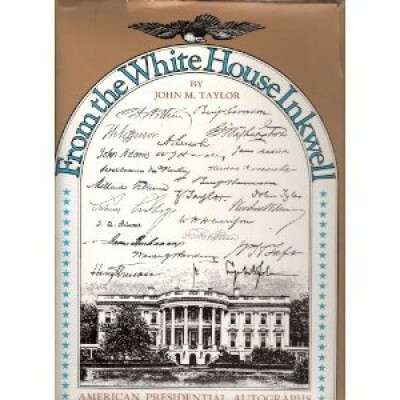 This 148-page book contains 90 photographic reproductions of at least one large hand-written letter from George Washington to Taft, and signed documents thereafter to Lyndon Johnson. This author discusses the use of autograph-pen "robot" machines that presidents (since at least Dwight Eisenhower) have used in signing their extensive correspondence. While this book was published in 1968, it remains useful for its revelations about dubious presidential autographs, forgeries, and how some used rubber or steel handstamps to sign their letters.